We're on Day 3 of Winter Storm Cleon and I've been happily trapped inside with no means to get out of our home. But it seems like when I'm with my daughters all day long without them going to school or me going to work, or at least a trip to Barnes and Noble where you have to have moments of silence, and I hear, "What's for lunch?" right after I just fixed breakfast.....well, it wont be much different! 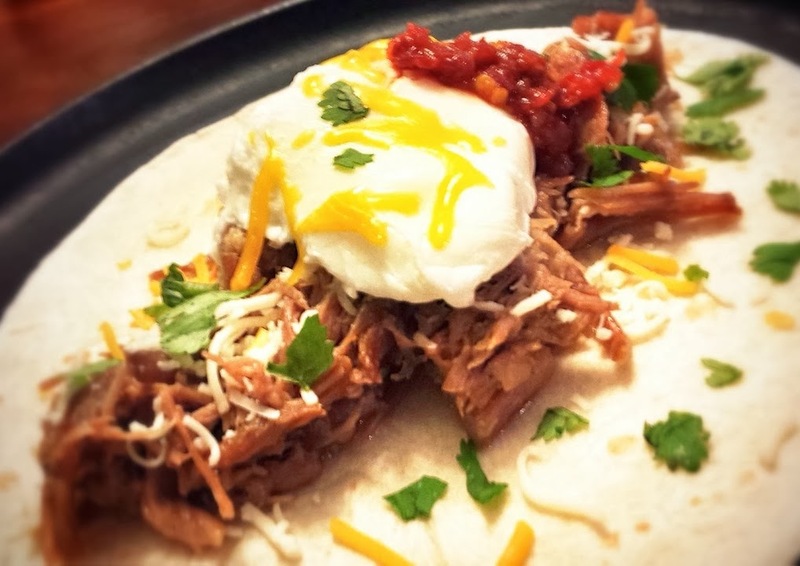 So I was checking out Chef Jason Roberts on Twitter to see what he was cooking these days, and I found a nice little breakfast taco for lunch that he had posted recently. Perfect! Thanks for the lunch idea, Chef! I proceeded to make my own breakfast taco for my sweet inquiring 10 year old. Marinate the pork in a large gallon sealable bag overnight and toss to turn occasionally. Cook the pork roast in a slow cooker for 7 hours on low with the garlic - infused oil, white wine, and white onion. Keep it on warm setting for another hour, totaling 8 hours. Remove the pork and shred with 2 forks. Crack an egg into a small ramekin. Heat 3 cups of water up to a boil in a small saucepan. When the water boils, reduce it to a medium simmer. Add 1 tsp vinegar. I used a coconut white balsamic vinegar. Garnish with cheese, cilantro, and chili - garlic sauce.